Spring is a fraught subject in this part of the world. In celebration of the first day of spring, the sky unfurled a massive, white party favour, dropping 30cm of snow over an already thickly blanketed landscape. It was an extravagant display of spring’s absence, in other words, and it will be another month before the ground clears and the grass begins to blush a tentative green. What to do in weather like this? Pour a cup of coffee and read about frogs. 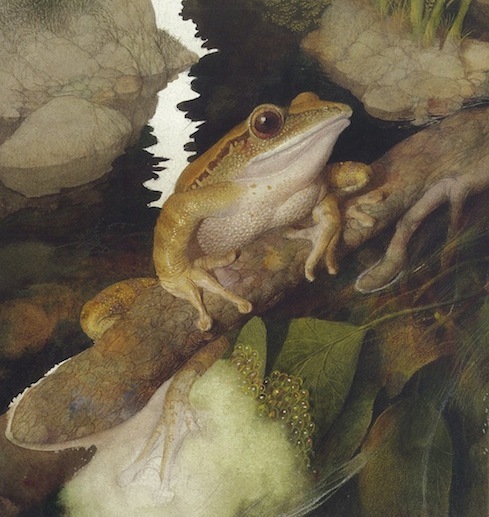 Following in the steps of their previous collaboration-Life in The Boreal Forest, Brenda Guiberson and Gennady Spirin have created the magnificent Frog Song, a paean to the beauty of the natural world, our precarious ecosystem, and spring’s noisiest amphibian. 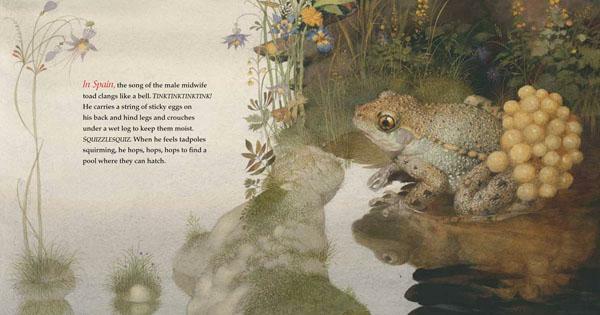 In onomatopoeic prose (“mwa”, “fwish”, “swee swee”, etc.,), Brenda Guiberson introduces the reader to an international cast of frogs, from the scarlet-sided pobblebonk of northeastern Australia to the European midwife toad, whose eggs are carried by the male on his exterior. 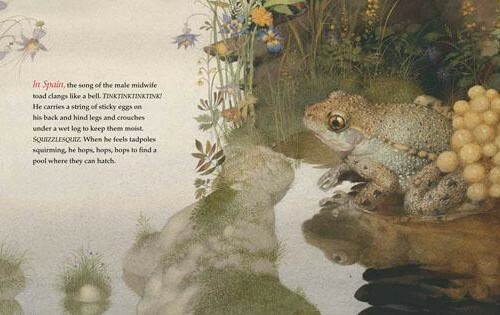 In Spirin’s hands, the eggs are a treasure of shimmering amber pearls heaped on the back end of the frog (who appears to be quite proud of his hoard.) I was pleased to see the Canadian wood frog, a pillar of endurance and adaptability in its ability to transform itself into a frogsicle in winter, included in the book. Once thawed, the wood frogs’ eggs are deposited along stream beds before the ice has completely melted. In my city, a bog located in a ravine I frequent bubbles to life in the spring, and the surface activity is accompanied by a soundtrack unlike anything I’ve ever heard, as if someone were pushing a stroller across gravel. Initially, I couldn’t place the source, but later discovered the strange sound was the mating song of the boreal chorus frog, a relative of the wood frog. No stereotypical ‘ribbit’ from this crowd, just rhythmic ‘craaacks’. It is something I look forward to every spring, although judging by the amount of snow outside, it will be awhile before the woods are filled with love-sick frog songs. 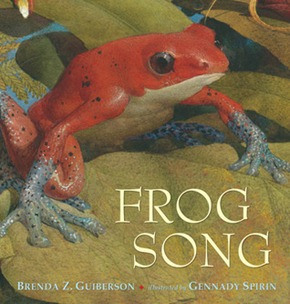 The illustration of the Costa Rican strawberry poison dart frog on the cover of Frog Song is so extraordinarily moist and life-like, it looks like a photograph, which is misleading. Frog Song is a work of imagination. It is a work of art. 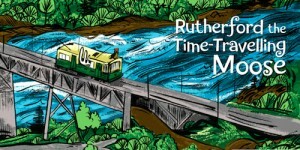 The cropped image is part of a much larger, two-page illustration. Not shown (on the cover) is the gently scalloped leaf the frog sits upon, and the brocade background of periwinkle blues and tropical greens woven together with such sensitivity, the effect is breathtaking. 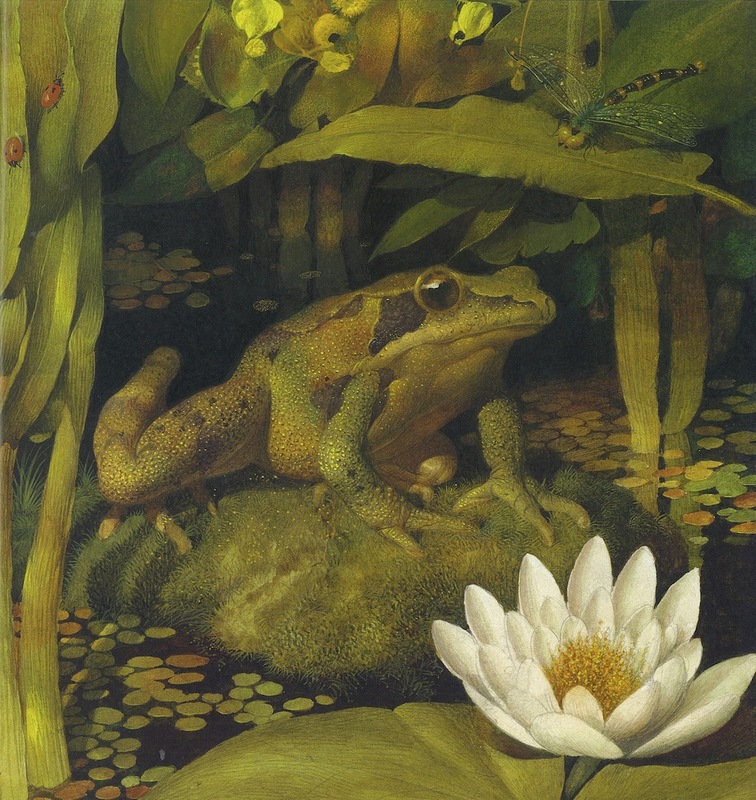 The art is realistic in the sense that the amphibians are scientifically identifiable (if not slightly more expressive), but the visual depiction of frogs and frog life within their natural habitat is as exquisite as a Renaissance painting. 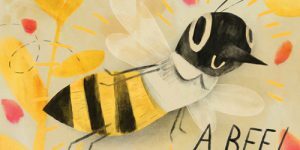 Swamp life has never been so richly detailed, with gorgeous insects, plants, and daubs of brilliant colour illuminating the background. Even more mind boggling is Spirin’s prolificity (he illustrates two or three books a year) given that each illustration in tempera, pencil, and watercolour has the sort of time-consuming, layered detail one would expect of a much older painter. Centuries older. As in Life in the Boreal Forest, Guiberson includes a very useful synopsis of the text and some additional facts and websites at the back of the book, along with a plea for ecological stewardship. 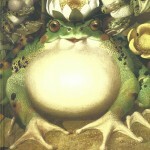 Frogs all over the world are in trouble, but there is nothing heavy-handed in the message. 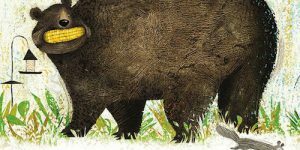 Frog Song is a celebration; a stunningly beautiful overview of international frog life from one of the greatest illustrators of our time. 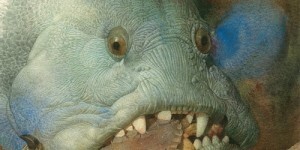 This frogopedia is not to be missed. 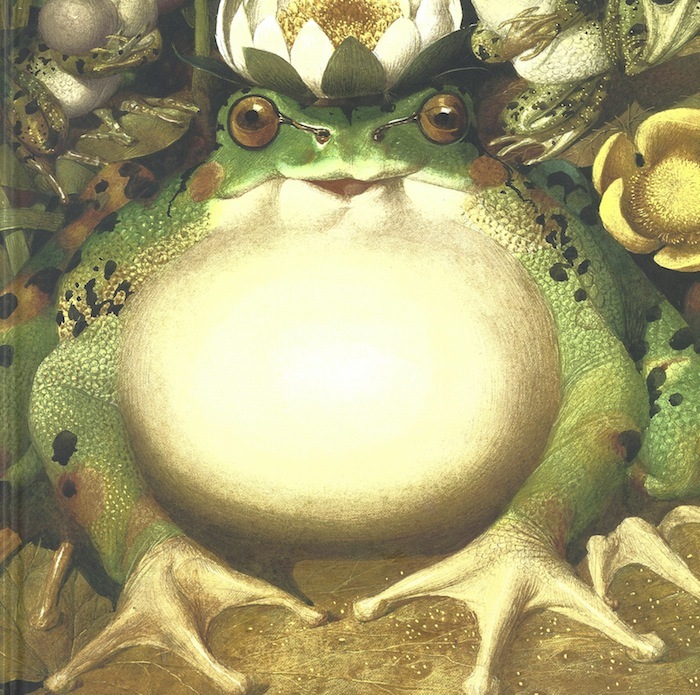 If you do decide to purchase or borrow Frog Song, and I insist that you do, have a look under the front cover. 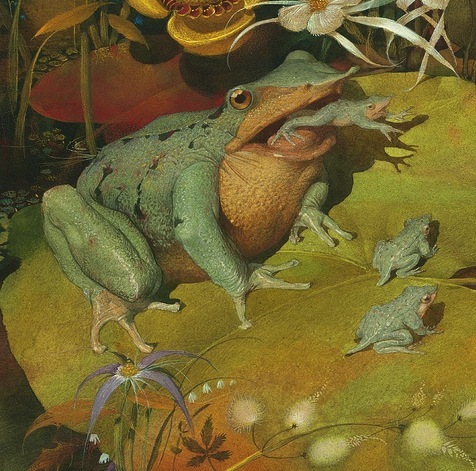 There is a frog not depicted anywhere else in the book; one entirely of Gennady Spirin’s imagination. He appears to be some sort of frog prince, with a lily for a crown and a small gathering of adoring froggy subjects. 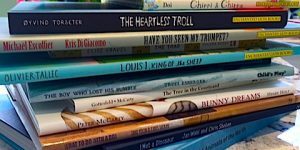 As any good bibliophile knows, especially one who collects children’s picture books, the boards beneath the cover often hold surprises, and even if they don’t, it’s all part of the experience. Gennady Spirin was born in the small town of Orekhove-Zuyevo, near Moscow, on Christmas Day, 1948. He graduated from Surikov School of Fine Art at the Academy of Arts in Moscow and Moscow Stroganov Institute of Art. 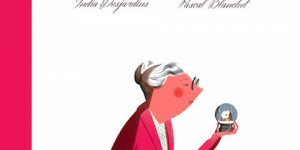 Mr Spirin has received five gold medals from the Society of Illustrators, and has been chosen four times for the New York Times Best Illustrated Books list. He lives in Princeton, New Jersey. Brenda Guiberson is the author of many books, including Life in the Boreal Forest, Ice Bears, and Cactus Hotel. She lives near Seattle, Washington. One Comment for "Frog Song"